Holi is a festival of colours. Just like nature there are different colours associated with our feelings and emotions. Each person is a fountain of colours that keep changing. Your emotions, like fire, burn you. But when they are a fountain of colours, they add charm to your life. Puranas are full of colourful illustrations and stories and there is a story related to Holi. An asura king, Hiranyakashyap, wanted everyone to worship him. But his son Prahlad was a devotee of Lord Narayana, the king’s sworn enemy. Angry, the king wanted Holika, his sister, to get rid of Prahlad. Empowered to withstand fire, Holika sat on a burning pyre holding Prahlad on her lap. But it was Holika who was burnt; Prahlad came out unharmed. Hiranyakashyap symbolises one who is gross. Prahlad embodies innocence, faith and bliss. The spirit cannot be confined to love of material only. Hiranyakashyap wanted all joy to come from the material world. It did not happen that way. The individual jivatma cannot be bound to the material forever. It’s natural to eventually move towards Narayana, one’s higher Self. Holika stands for past burdens that try to burn Prahlad’s innocence. But Prahlad, so deeply rooted in Narayana Bhakti, could burn all past impressions (sanskaras) and joy springs up with new colours. Life becomes a celebration. Burning the past, you gear up for a new beginning. Your emotions, like fire, burn you. But when they are a fountain of colours, they add charm to your life. In ignorance, emotions are a bother; in knowledge, the same emotions add colour. Each emotion is associated with a colour—anger with red, jealousy with green, vibrancy and happiness with yellow, love with pink, vastness with blue, peace with white, sacrifice with saffron and knowledge with violet. 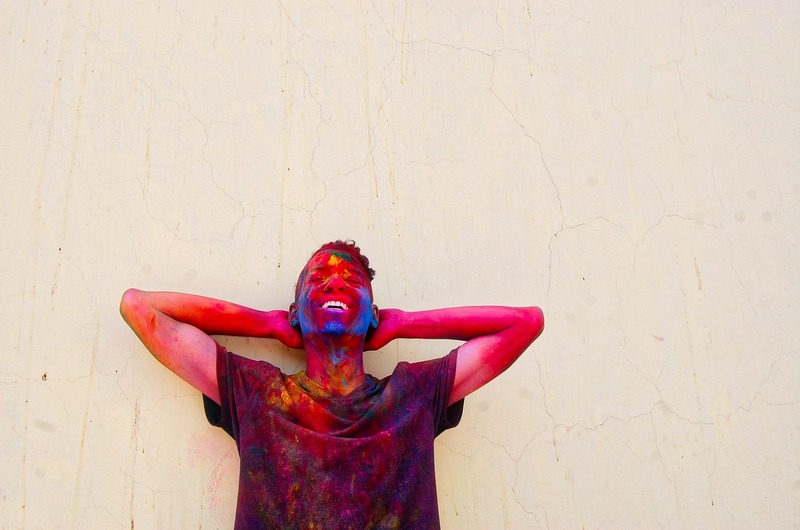 Like Holi, life should be colourful, not boring. When each colour is seen clearly, it is colourful. When all the colours get mixed, you end up with black. So also in life, we play different roles. Each role and emotion needs to be clearly defined. Emotional confusion creates problems. When you are a father, you have to play the part of a father. You can’t be a father at office. When you mix the roles in your life, you start making mistakes. Whatever role you play in life, give yourself fully to it. Harmony in diversity makes life vibrant, joyful and more colourful. Any joy that you experience in life is from the depth of your Self when you let go of all that you hold on to and settle down, getting centred in that space. That is called meditation. Meditation is not an act; it is the art of doing nothing! The rest in meditation is deeper than the deepest sleep that you can ever have because in meditation you transcend all desires. This brings such coolness to the brain and it is like servicing or overhauling the whole body-mind complex. Celebration is the nature of the spirit and the celebration that comes out of silence is real. If sacredness is attached to a celebration, it becomes total, complete. It’s not just body and mind but also the spirit that celebrates. In a state of celebration, the mind often forgets the divine. We should experience the divine’s presence, the divine light around us. You should have a desire to experience the something by which the whole world is running. To experience this through your prayers, there should be total involvement. If the mind is preoccupied elsewhere, then that is no prayer at all. Prayer is a vital tool to improve your life. When you are faced with obstacles, deep prayers can work miracles. Prayer happens in two situations, or in a combination of situations. When you feel grateful or when you feel utterly helpless. If you are not grateful and prayerful, you will be miserable. The feeling that “I am blessed” can help you overcome any failure. Once you realise that you are blessed, then all the complaints disappear, all the grumbling disappears, all the insecurities disappear. What you can do, you do. What you cannot do, you pray for! It is said that the divine dawns in you when you pray for it, when you cry for it. The divine is only waiting for you to dig a little deeper into yourself. You are like a free bird. You are fully open. Feel that you are flying like a bird. Learn to fly. This is something which you have to experience within yourself. If you consider yourself bonded, you will remain bound here. Become free right now. Sit down and become contented. This life has so much to offer to us. We can realise this once we take some time off, rejuvenating the soul. You are afraid of opening your fists. What do you have that you have to hold your fists? You own nothing. Open your fists and you will find the whole sky will be in your palms. Spirituality is not some ritual, or an act. It is a very pleasant, uplifted state of being and being able to see that the whole world is all spirit or consciousness. And in that state of being, celebration dawns spontaneously and life becomes full of colours. On the day of Holi our life too should blossom with the colours of enthusiasm and love. Our face should glow with happiness and our voice should resonate with sweetness. Such should be the colour of life—the colour that springs from deep faith in the Divine. What you do or what you give, nature brings you back more of it. If you give misery to others, you get that back, if you give happiness, you get that, and if you share what you have, with others, it comes to you multi-fold. What obstructs this giving nature of ours? Our aversion to people. See, there are all kinds of specimen who are needed on this planet. They make the world more colourful. They push certain buttons in you and evoke certain emotions in you, and see how you act or react to it. What should be our goal? Tell them, ‘Hey! Wake up! Laugh and Smile.’ We should become such that wherever we go, the fragrance of love and happiness spreads from within us. Regardless of the events or circumstances, remain steady and established in the Self; remain happy and blissful. If we have inner contentment, not only will we be able to fulfil our own desires, but we will also be able to fulfil the wishes of others. Holi is a festival of fun and frolic, of happiness. And this colour of life should drive us to do some good work for the society and nation. Sri Sri Ravi Shankar is the founder of the Art of Living Foundation and the International Association for Human Values which collaborate on humanitarian initiatives worldwide. Sri Sri’s work includes armed conflict resolution, U.S. Veteran PTSD relief, prisoner rehabilitation, addiction treatment, poverty alleviation and human rights advocacy. He developed a powerful breathing technique called Sudarshan Kriya Yoga (SKY) that makes use of the relation between breath and emotions by including specific rhythms of breath that harmonize the body, mind and emotions and help individuals find relief from stress. His programs have reached an estimated 370 million people in 155 countries.